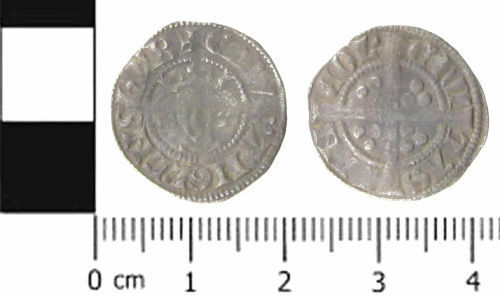 A medieval silver coin; a penny of Edward I (1272 - 1307), probably class 3f (1280 - 1281) minted at Canterbury (North number 1021). A silver penny of Edward I, long cross reverse, Lincoln mint, probably Class 3f, 1280 - 1281. North Vol 2, p.29, no.1021.